Simple As That - The Muslimah’s Practical Guide To Building Strong Family Ties by Nafla Salahudeen, is another good book I read lately on family bonding and relationships. It is a complete guide for every woman who wants to lead a happy life with her family and maintain good relationships with her kin. The book says it is not difficult but it is as simple as that. We are living in the era of feminism where we talk about equal rights for women and that becomes one of the hottest topics of discussion everywhere. We have a natural tendency to forget responsibilities while we keep thinking all the time about our rights. When we get reminded about our responsibilities, we say to ourselves ‘Well, I don’t get my rights, why should I think about my responsibilities?’. As much as it sounds hard, Rights and Responsibilities are two different things. In such conditions, this book comes as a reminder. Each girl is unique but they need to be nurtured well and taught with the basics to meet their future with confidence and understanding. Being born a lovely daughter, she is expected to fulfill certain important roles in her life. The stability of these roles and her happiness in them is largely determined by how she was brought up. While academic education doesn’t shape her into a good human being, but what she learns from her parents, build her a strong personality, to become an all-rounder, and a winner among her loved ones. To begin with, the way the topics in the books are arranged are simply fitting to the significant stages of relationships in every woman's life. From the Mother Daughter relationship, to being a Spouse, then daughter-in-law and finally becoming the mother-in-law, this quick guide talks about the important phases of every woman’s lives where we need to be aware of our responsibilities and be sure that we act selfless. In the chapter of Am I bringing the poison - You and Your heart, the story of Li-Li titled ‘How to poison your mother in law’ was very interesting and a quirky lesson on being free of expectations by giving our best. I liked the way the author quotes beautiful Hadees and Quranic verses, in every chapter. These references make it easier for the Muslimahs to connect to the ways of Prophet Muhammed (PBUH). The book emphasizes on each aspect of the responsibilities and the rewards promised by Allah. This book is very relatable and many situations we, as a woman, may have encountered. There are practical situations and the kind of mistakes, we usually do. This book gives us the tips to overcome the same. It all looks more like a common sense but that’s where many of us fail succumbing to the situation and end up turning it unpleasant. Insha Allah, the Holy Quran and the Prophet’s (PBUH) Sunnah will guide us to practice these guidelines and find peace in our life. 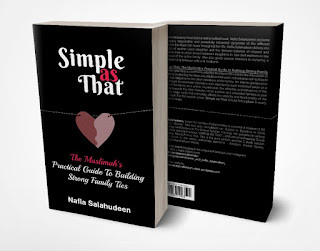 Author, Nafla Salahudeen's dream of sharing a beneficial message to the Islamic community and her passion towards writing has led her towards this book. Life and circumstances are not that difficult to handle. It is as simple as that. Well, if only we know how to handle the situations. I appreciate the author for pointing out the reality and the part what a woman plays in both family and the society, to give the best to the people in her life to build strong ties and lead a happy life. This book is available in both English and Tamil. And you can purchase this book by ordering via WhatsApp at +94773799198. 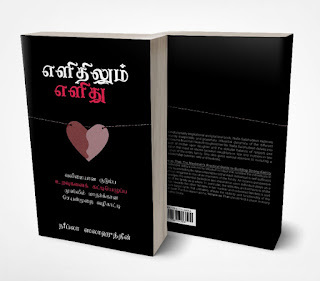 Tamil book costs 3 USD and English version costs 4 USD. Simple as That, is targeted to Muslim women but I would recommend this book to women of all community and ages to read and get enlightened. After all, it is about our relationships and responsibilities. I like books like these that will help improve relatonships, espeically among family as there is always something going on (well in my family is never as simple as that) I have read a book similar before but it covered many other topics besides relationships. A very detailed review. Which book will you be starting next? Nice review. Common sense is not a common thing, I agree.